First of all, what in the world is a samara? No, it is not even close to being related to the metallic element of samarium nor does it carry a sword like the Japanese samurai warrior nor does it help people in distress like a good Samaritan. Instead it is a botanical term for a dry, one-seeded winged fruit commonly found on elm and ash trees. The Oregon Ash (Fraxinus latifolia Benth.) is a native tree to the west coast that is in the olive family of Oleaceae. 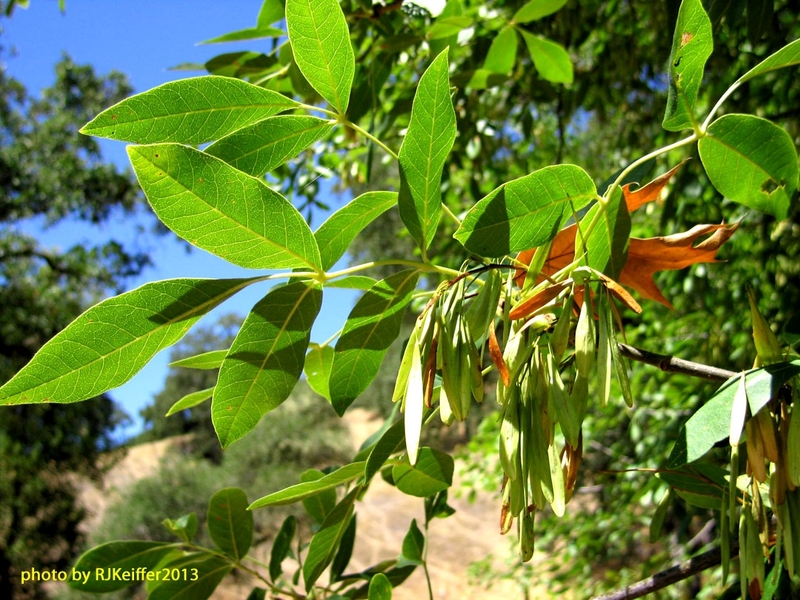 Commonly found in wetland or riparian habitats, it is also found along drainages and seasonal water courses that lead into the dry oak woodlands of the North Coast. It is sometimes found in a shrubby form, but usually attains tree size of 40-80 feet and an age of up to 250 years. In California it can be found in the Coast Ranges down to Santa Clara County, in the Sierra Nevada ranges, and also in the Great Central Valley. The fruits, called elliptical samaras, flutter to the ground in an action that resembles that of a a helicopter ... and a wind can distribute the ripe seed a good distance away from the parent plant. This plant follows the Parson's Creek corridor, the natural ponds, and many drainages here at the UC Hopland Research & Extension Center.